Buy Dryer machine/Nuts dryer/high quality conveyor belt microwave nut dryer machine - Shandong Leader Machinery Co.,ltd. Jinan LDLeader machinery company specializing in the production of microwave equipment, microwave baking equipment. Material is heated by microwave baking will be itself as a heating element, microwave baking effect can be instantaneous go deep into the inside material, make the material inside and outside heat at the same time, do not need to heat transfer process, so the temperature rise rapidly, greatly shorten the heating time, the time required for about a quarter of the conventional methods in general. For nearly 10 years, microwave energy application technology is being widely applied in melon seeds, peanuts, walnuts, almonds, pistachios, dried fruit such as chestnut baked, and peanut, chestnut peeling. 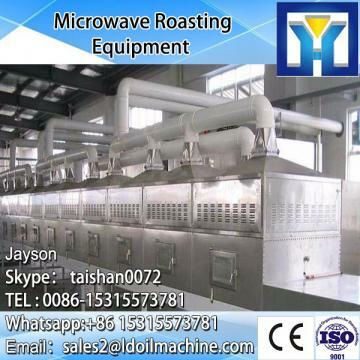 Compared with the traditional mode of production, microwave can be baked dry fruit grain bulking and crisp delicious, full, colour and lustre is natural, good appearance, and have insecticidal sterilization effect, microwave equipment can greatly improve the production environment, is the enterprise achieve civilized production, the choice of product grade. Our company has engaged in producing and exporting dryer machine/Nuts dryer/high quality conveyor belt microwave nut dryer machine for many years, and until now, our machine has exported to overseas market, such as Brazil, India, Indonesia, Russia, Thailand and so on, and get the foreign customers' unanimous praise. We believe that you purchase shandong leader machinery co.,ltd. dryer machine/Nuts dryer/high quality conveyor belt microwave nut dryer machine is your best and sensible choice.